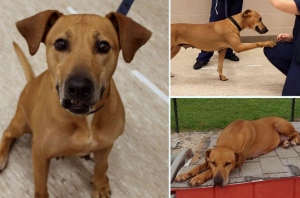 Ireland’s journey has been a rough one, as any shelter dog’s is. She came to the Pawsitive Corrections Youth-Canine Program at Marion County Juvenile Detention Center as a shy and uncertain seven-year-old who was confiscated from her previous owner due to abuse and neglect. At first she was nervous with the youth, afraid of the brush when they tried to groom her, but she soon started to warm up and respond to the positive reinforcement training. After excelling in the week-long program, she returned to Indianapolis Animal Care Services where she waited anxiously to be adopted by a new family. After a few days though, Ireland was not faring well. Her stress levels rose the longer she waited in the chaotic kennels of the shelter, and eventually she was removed from the adoption floor because of her anxious temperament. Her life was now at risk, and Paws & Think had to pounce to action to help save her. Frantic emails went out, and another shelter, the Humane Society for Hamilton County, agreed to rescue her if a foster home could be found. More emails went out, and finally a volunteer stepped up to save Ireland’s life. Dr. Linda Hoss, a retired dentist who has been volunteering with Paws & Think’s Youth-Canine program for over three years, rose to the call to rescue one of the program’s graduates. “I just couldn’t let one of ‘our’ dogs be euthanized,” she said, explaining that she took a risk in offering to foster Ireland, knowing nothing about her except that she had not been treated well in her past but was a favorite in the program for her sweet nature. Linda had no idea if Ireland would get along with the other rescued dog in her home, but she volunteered to take her in, trusting that she could help Ireland on her path to finding a permanent home. It has been less than three weeks since she moved to her foster home, and Linda reports that Ireland is looking happier and healthier already. When Linda is not saving lives, she enjoys cooking, reading, movies, and hanging out with her dog and her friends. She teaches at the IU School of Dentistry and occasionally returns to her former career of dental practice as a substitute. 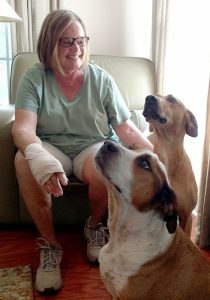 Her one child lives in Tennessee, and she currently lives in Indianapolis with Ireland and her other rescued dog, Venus. Ireland is available for adoption from Humane Society Hamilton County. Please contact them at 317-773-4974 to set up a meet and greet. Ireland was such a sweet girl when I spent time with her at the JDC. It is always so hard to send them back to the shelter where the environment is SO stressful, especially for the timid and unsure…..and truthfully, that was a BIG part of my decision to bring Bailey home….she HAD to be rescued. I’m so thankful that Ireland had Linda to step in and give her a safe, secure option until she is adopted…and I know Ireland is thankful, too!!! !